The kids are out of school and the joyful sounds of laughter and playing echo across the lake. Human children aren’t the only youngsters enjoying these bountiful days of summer. It’s baby season for everything that walks, crawls, climbs, flies and swims around Lake James State Park and all it takes is a watchful eye and a dose of curiosity to enjoy the show. Number 1 on everyone’s mind are the whitetail deer fawns that are recently born. 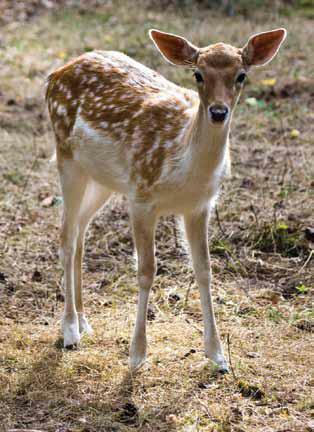 While most whitetail moms keep their offspring well-hidden deep in the woods during the first couple of weeks, it won’t be long before the spotted fawns gain confidence and curiosity in the world around them. Motorists on park roads need to be cautious of these wobbly-legged, rambunctious youngsters as they wise up to the hazards of modern traffic. Turtles of several varieties are also on the move as the females search for suitable egg-laying sites. Even aquatic species like yellow-bellied sliders and eastern painted turtles make long treks across dry land to find sandy, loamy soil to dig a deep hole and deposit their leatheryshelled eggs. It will be interesting to see how the area’s nesting songbirds fared through record-setting rainfall during the month of May. Heavy spring rains typically result in low productivity for breeding birds so it’s likely we will see fewer fledglings this summer. Weather that’s unfavorable for one group can be favorable for another. It’s hard to remember a time when the park was greener than it is today. Trees and plants of every type appear to be thriving with the surplus of water followed by the summer sunshine. Healthy vegetation now will translate into lots of forage for herbivores heading into fall. Deer, bears, mice and insects should have lots to eat as they prepare for winter. Winter – it seems crazy to even mention it now, but every action has a reaction in nature and what happens in the environment during the heat of summer will have a direct effect on the health of critters as they head into the toughest season of the year. Hope to see you out on the trail! Your help is needed! Without the contributions by people just like you Friends of Lake James State Park would not exist. If you would like to become a member of this organization, please visit Membership. Copyright © Friends of Lake James State Park, Inc. Developed by VanNoppen.